.Schoolkid.Ph ( http://www.schoolkid.ph) was launched in August 2008. It is an online resource for preschool and elementary educational worksheets/reviewers. 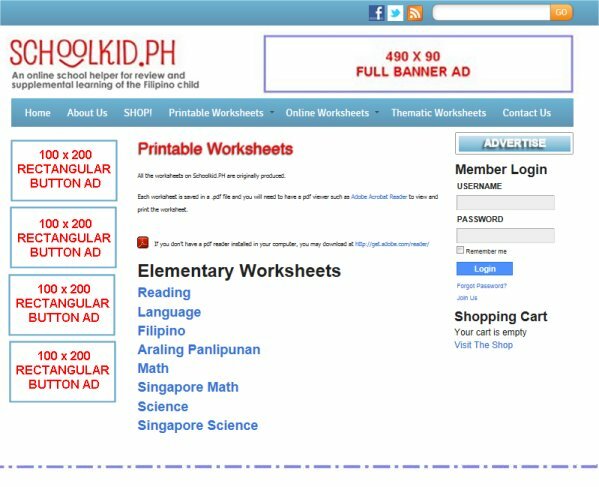 While there may be a number of educational resource websites already found in the internet, Schoolkid.Ph is the only FREE website that addresses Philippine-based educational curriculum and includes subjects like Filipino and Araling Panlipunan.. The current viewers of Schoolkid.Ph website are mainly parents, male and female, with school-age children (currently Preschool – grade 6 level), of various occupations and of various household types. The website has no geographic limitation, thus, having a nationwide appeal. As of 31 September 2012, there are 15,000+ registered users of Schoolkid.Ph. The website receives a monthly average 230,000+ pageviews and 8,000+ unique visitors. Schoolkid.Ph also maintains a Facebook Page (http://www.facebook.com/schoolkidph) which currently receives 1,500+ Likes. .Ad Type 1: Full Banner (490 x 90) – appears on ALL pages of the website. .Ad Type 2: Rectangular Button (100 x 200) – appears on Elementary Printable & Online Worksheets section or Preschool Printable & Online Worksheet sections. 1. All advertising material is subject to approval by Schoolkid.PH, who reserves the right to reject or cancel any advertisement deemed to be unsuitable for any reason. 2. All digital materials should be supplied by Client. 3. All banner advertisements are non-rotating. The ads will be shown within the duration of your ad campaign. 5. Ad placements are on a first come-first serve basis only. While every effort is made to ensure that competing advertisements do not appear on the same page, no guarantee is made that this will not occur should there be space limitations. 6. We will not accept re-layout/modifications of the banner ad after it has been finalized and uploaded on the website. 7. The advertiser and any associated companies acknowledge that they own the rights and permissions to publish submitted material on the Internet. Each agrees jointly and severally to indemnify and save harmless Schoolkid.PH against all damage, loss, expense and liability of any nature arising from our use of the advertisers submitted graphic content on the Internet. 8. Schoolkid.Ph will not be liable for delays in publishing or failure to publish submitted advertising content in the event of circumstances beyond the control of Schoolkid.Ph. Advertise with us for the months of November and December 2012 and you get the month of Januyary 2012 FREE! Limited slots only and must be booked on or before 31 October 2012. Contact us now! Kindly email ads@schoolkid.ph to request for additional information and current ad rates. Advertising rates depend on average monthly viewership. Please state your name, company and contact numbers (tel#/cell#/fax). Our Ad Sales Associate will contact you back for the full information.